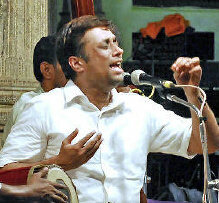 Sanjay Subrahmanyan (born January 21, 1968) is a Carnatic Music singer from India. He performed in many concerts in India and overseas and has won many awards for his excellence. He believes that listening takes a musician closer to perfection.He is very simple and very open. He is a strong cricket fan.